The top-secret TPP was given a sharp stick up its arse by the US Senate, which refused to allow the Executive Branch ability to "fast track" its secret trade negotiations. We'll soon hear how Senators are deeply concerned about their essential need to debate key concessions, and how public transparency should be required. Actually, it's likely more Senate members want access to the corrupt money underlying the treaty process. Many of these individuals will shut up & climb onboard if given a chunk of the wealth. 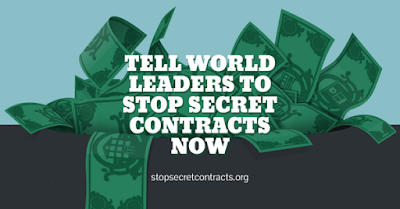 There's NO good reason trade deliberations should be kept secretly hidden from public review!